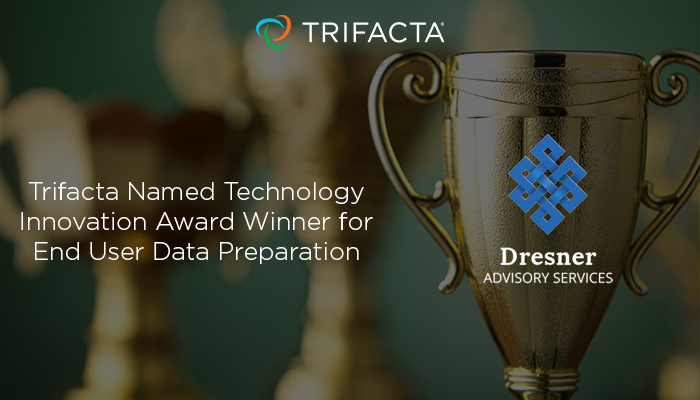 San Francisco, CA – December 16, 2016 – Trifacta, the global leader in data wr angling, today announced it has won the Dresner Advisory Services 2016 Technology Innovation Award in the End User Data Preparation category for the second consecutive year. The award program recognizes the top vendors in each of Dresner’s Wisdom of Crowds® thematic market studies. The annual research reports are based on data collected from end users and provide a real-world perspective on various technical capabilities related to the business intelligence (BI) and analytics markets. The second Dresner Advisory Services End User Data Preparation Study was published in February 2016 and Trifacta was named the 2016 top vendor. The report examined usage trends of self-service data preparation software that enables end users to effectively model, prepare and combine data prior to analysis. Download the full report here. In 2016, Trifacta has been recognized as a 2016 IDC Innovator for self-service data preparation, named to The Channel Company’s 2016 Big Data 100 list, selected as champion and top vendor in the 2016 Self-Service Data Preparation & Cataloguing Market Update by Bloor Research and selected as a Delta-V Award winner for the big data platforms category by Enterprise Strategy Group (ESG). Trifacta, the global leader in data wrangling software, significantly enhances the value of an enterprise’s big data by enabling users to easily transform and enrich raw, complex data into clean and structured formats for analysis with self-service data preparation. Leveraging decades of innovative work in human-computer interaction, scalable data management and machine learning, Trifacta’s unique technology creates a partnership between user and machine, with each side learning from the other and becoming smarter with experience. Trifacta is backed by Accel Partners, Cathay Innovation, Greylock Partners and Ignition Partners.